First off can I just say I’m impressed that snausage is autocorrected in my phone. But the point of this post is to brag about my boyfriend. As I was organising all my clothes into my new wardrobes (sheesh I have a lot – and still nothing to wear) my boy took himself off into the kitchen and started making dinner. He is a good cook. I would live with him if he couldn’t cook. That just doesn’t fit with my values regarding gender equality and stereotyping. And if he can’t accommodate my values then sorry – not on. So he can cook. Sure his repertoire is BBQ, breakfast, brunch, and brinner, but it’s the actions that count. Oh and he does good steak. 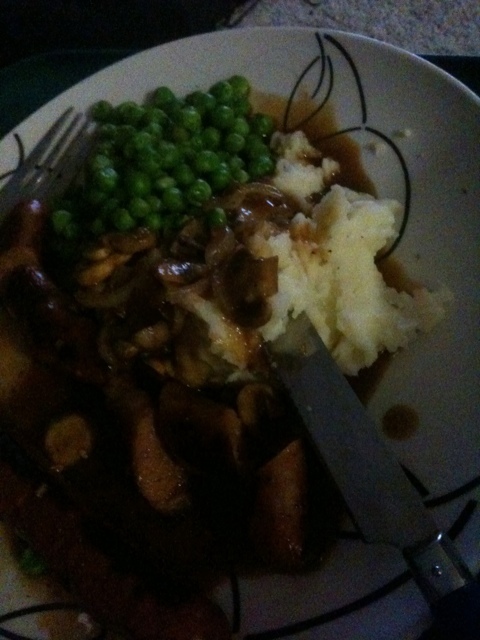 So off he went into the kitchen, and cooked me mashed potatoes, with sausages, mushroom gravy (gravox) and sugar snap peas. 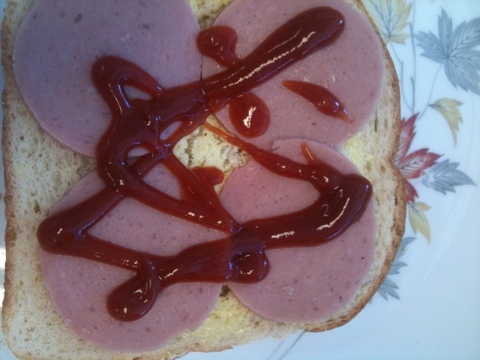 And bonus points for polony sandwiches.